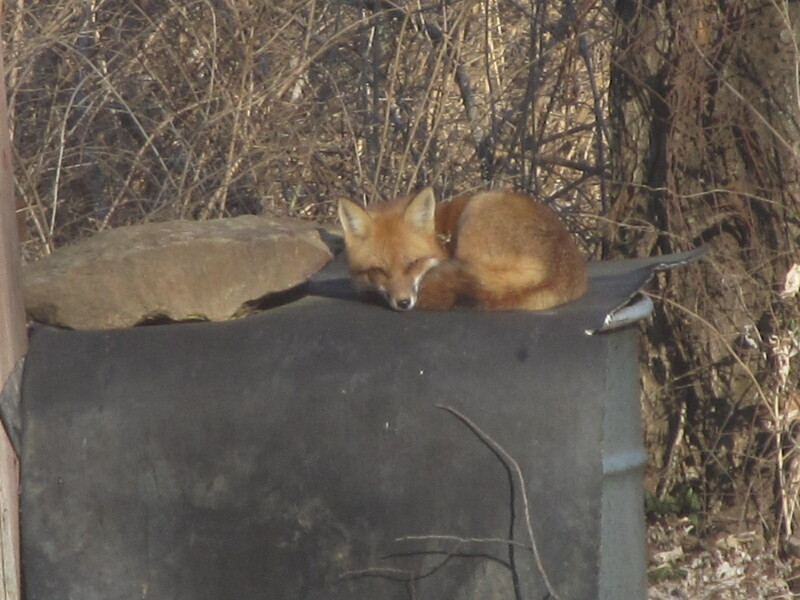 I didn’t see the foxes during our last two days of cloudy weather. It’s convenient to have my computer by the picture window that overlooks our backyard. The sun is out, the wind calm, and the 42-degree temperature must feel warmer on the piece of conveyor belt. 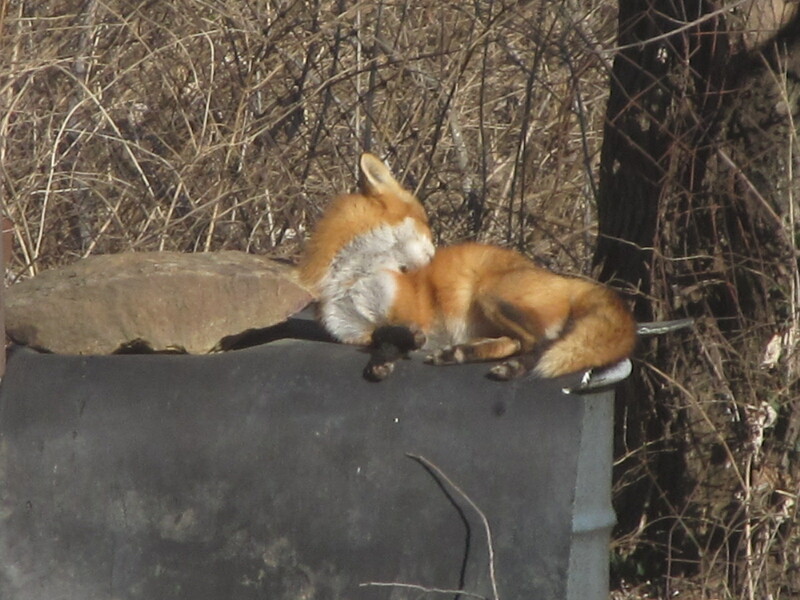 And then she just couldn’t stay awake any longer in the warm sunshine. This picture was taken later, and I suspect this one’s the male. 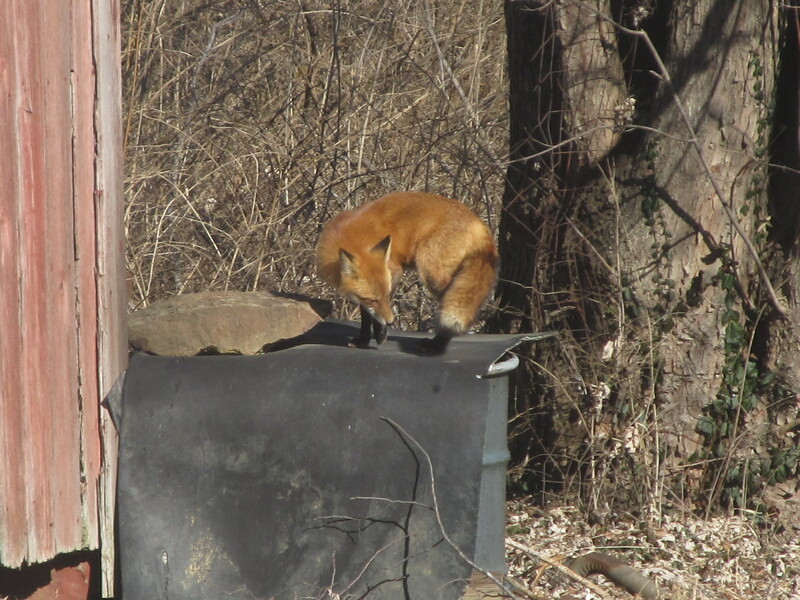 Its color seems darker than the fur of the one in the other pictures. The sun just set. 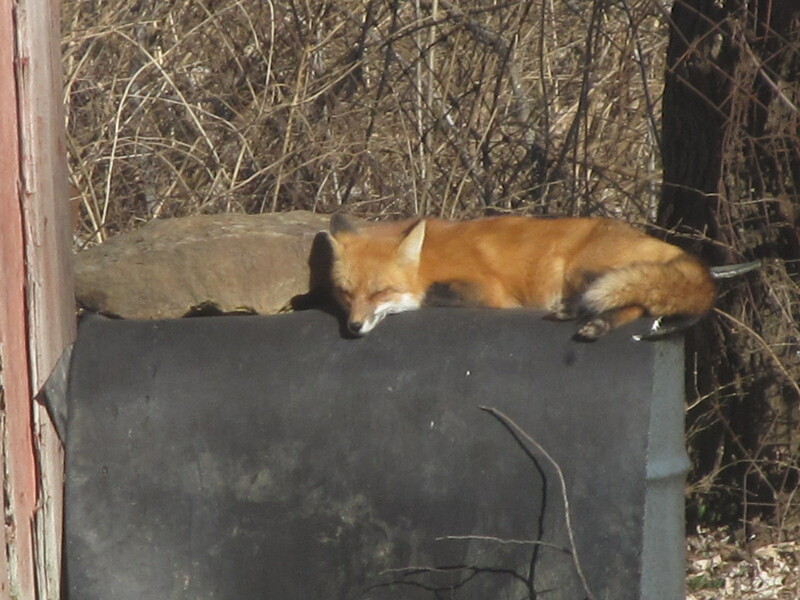 The male fox is still curled up asleep. The temperature’s now down to 40. They act like they don’t have a care in the world. I’m surprised the scent of your dog doesn’t bother them. What a great opportunity to study them up close though! They’re taking advantage of the sunshine. We’ve had very little of it lately. I can’t wait until there are little ones running around. Good one! I hadn’t thought of that. Beautiful Kathy! Love that yarn shot! They look so content, feeling very safe. Can Buffy see them out any windows? Buffy can’t see them from the house. She checks her territory when we’re out and marks it. That’s how I knew they were here in the first place. They can come and go from behind the barn too. I’m interested to see how big she will be before she gives birth. Thought “yarn” was cute. 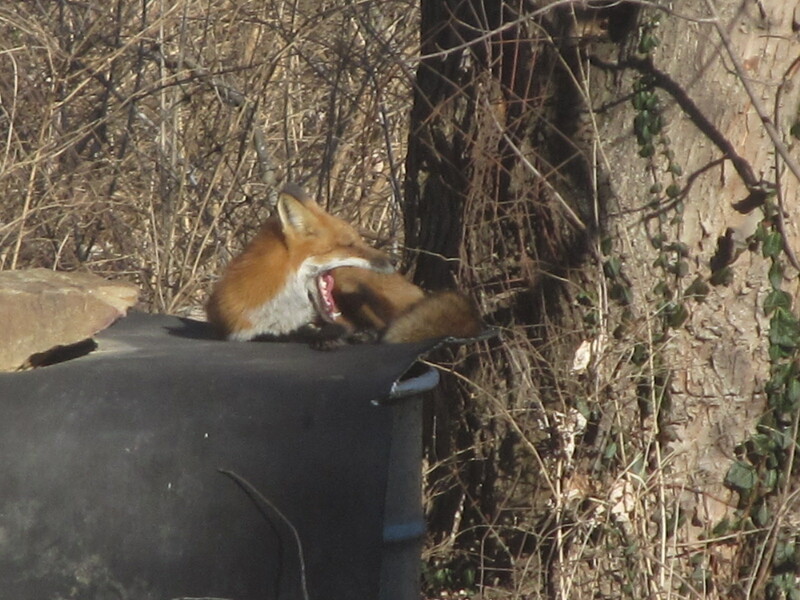 Foxes will do that to a person. I’m guessing you don’t have dogs running through your property. 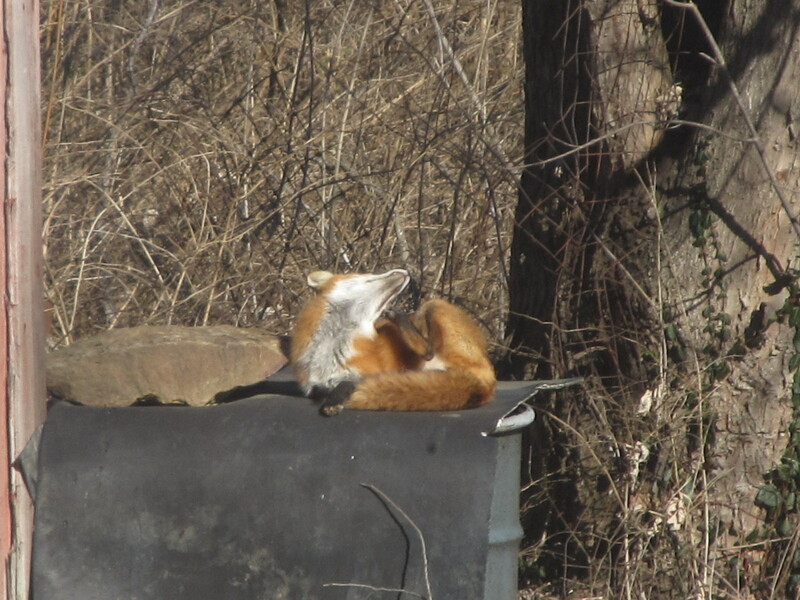 It’s great to see foxes relaxing in your back yard. A neighbor on the next road to the north has a young German shepard that runs around occasionally. Buffy checks things out when we’re out. The opening to under the barn is too low for a dog to get under.